In 2016, approximately 4,688 hectares of ash trees were found to be in decline or mortality due to Emerald Ash Borer (Agrilus planipennis, EAB) in the province of Ontario. That’s down from just over 41,000 ha in 2015. This data is collected by the Ontario Ministry of Natural Resources and Forestry. Although no aerial survey was completed by OMNRF in 2017, the numbers are on the decline since this pest has been chewing its way through our ash trees for at least a couple of decades now. It is estimated that nearly 247,000 ha of ash trees have been decimated by EAB in Ontario. The northern provincial limit runs from the Sioux and east towards to Quebec border. The Canadian Food Inspection Agency is monitoring the northern expansion of this infestation zone through trapping. 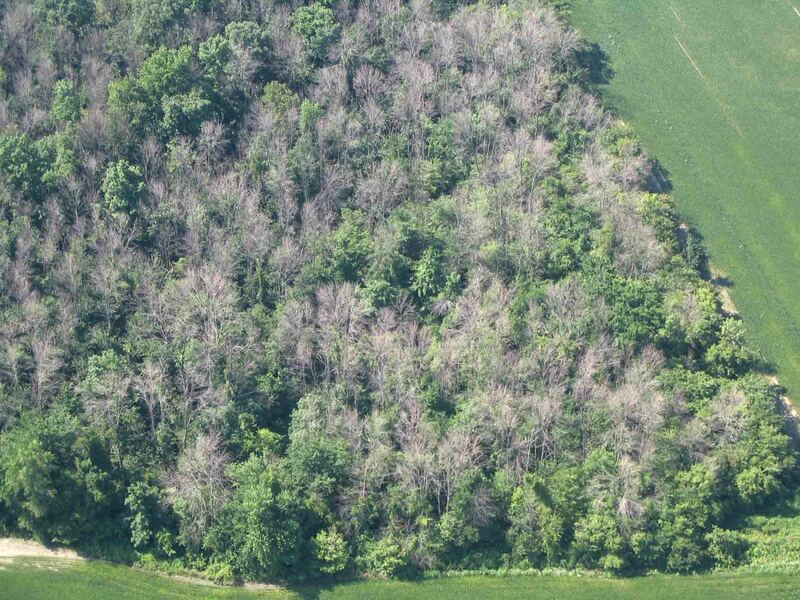 Since 99% of ash trees are killed within five-to-seven years of emerald ash borer advancing into an area, the spread of EAB is a major concern. Thankfully, CFIA found no EAB adults above that northern line this year. Dr. Krysta Ryall and her team from Natural Resources Canada have been releasing non-stinging, parasitic wasps since 2013. Dr. Ryall gave a very detailed summary of their biocontrol efforts at the Forest Health Review in Orillia last week. The wasps are part of a “classical biological control strategy” where various egg and larval parasites were recovered from native EAB populations in China and brought back to North America to be evaluated for their potential as an effective biocontrol agent here, followed by release into the environment. Tetrastichus planipennisi (photo above: Stephen Ausmus) was the first species of parasitic wasp that was approved for release by the US government, followed by Canada. Tetrastichus is a larval parasite; the adult female lays 50-60 eggs through the bark of the ash tree, directly into the larvae of EAB feeding in the underlying phloem and sapwood. How on earth Tetrastichus can so accurately find the larvae is beyond me, but researchers say she is more successful on small caliper trees with thinner, immature bark. The wasp larvae consume the EAB larvae, eventually killing them. The wasps then pupate and emerge as tiny adult wasps, ready to breed and lay more eggs. Dr. Ryall reports that Tetrastichus adults have been released in about 12 sites across Ontario and Quebec since 2013 (and in Michigan since 2008). Oobius agrili is an egg parasite; the adult female lays eggs inside the eggs of the EAB. It has proven to be quite successful. Spathius agrili was another species that showed great promise as an ectoparasitoid of EAB larvae in China. Researchers failed to recover this species after introduction. Spathius galinae was the fourth species approved for release in the United States (2015) and in Canada (2017). Dr. Krysta Ryall releasing parastic wasps against EAB in Ontario. And how are the parasitoids doing? Of all the parasitoid wasp species released, Tetrastichus has shown the most promise of establishment in North America. Ten states in the US have documented both Tetrastichus and Oobius’s ability to successfully establish a reproducing population. In Canada the situation is similar with Tetrastichus being recovered from all of the release sites in the years following release, this species has been recovered from 68% of the trees that were sampled! The US thinks that the population growth rate of EAB could be slowed by parasitoids. Although it is still a little early to tell in Canada, researchers are hoping these beneficial insects will have a significant long term impact on Emerald Ash Borer. This entry was posted in Borers in Landscape Trees, IPM and tagged biocontrol EAB, krysta ryall, natural resources canada, omnrf, ontario ministry of natural resources and forestry. Bookmark the permalink.